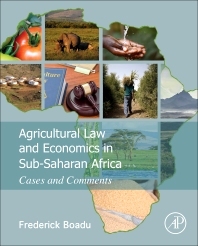 Agricultural Law in Sub-Saharan Africa: Cases and Comments introduces the subject of agricultural law and economics to researchers, practitioners, and students in common law countries in Sub-Saharan Africa, and presents information from the legal system in Botswana, Gambia, Ghana, Lesotho, Malawi, Nigeria, Sierra Leone, South Africa, Swaziland, Tanzania, Zambia, and Zimbabwe. The law and economics approach entails the use of quantitative methods in research. This is consistent with the expectations in an applied economics field such as agricultural economics. Covering the general traditional law topics in contracts, torts, and property, the book goes further to introduce cutting-edge and region-relevant topics, including contracts with illiterate parties, contract farming, climate change, and transboundary water issues. The book is supported by an extensive list of reference materials, as well as study and enrichment exercises, to deepen readers’ understanding of the principles discussed in the book. It is a learning tool, first and foremost, and can be used as a stand-alone resource to teach the subject matter of agricultural law and economics to professionals new to the subject area as well as to students in law school, agricultural economics, economics, and inter-disciplinary classes. Professionals, students and researchers in traditional economics, Agricultural economics, law school, interdisciplinary social science courses, or at an international organization research center. Chapter 1 – What Is Agricultural Law? Chapter 1. What Is Agricultural Law? 17.7 What Is the Carbon Market? Dr. Boadu holds advanced degrees in Agricultural Economics and law. He has taught a survey of Agricultural law course for over 22 years in the Department of Agricultural Economics at Texas A&M University, College Station, Texas. He has also presented lectures on legal aspects of water resources, climate change, agricultural biosecurity, and bioenergy in the United States and Sub-Saharan Africa (SSA). Dr. Boadu is a member of the State Bar of Texas committee on continuing legal education in agricultural law. He has extensive international development experience and has worked with diverse stakeholders including governments, bilateral and multilateral development institutions, voluntary organizations and private sector entities. He is a Diplomacy and Risk Policy Fellow of the American Association for the Advancement of Science (AAAS), and the recipient of several teaching and research awards. He has published widely in law and agricultural economics journals.